Papyrus G5 is the latest addition in the d.gen’s high-speed direct-to-paper printers range. This fully integrated production system comes with the latest Ricoh Gen5 printheads that guarantee up to 138 sqm/h printing speed, Furthermore, the wellmatched paper feeding and take-up units provides good feeding of transfer paper which allows high productivity and 24/7 operation. Papyrus G5 could be considered as a Low cost production printer. It could bring you over 40% lower production cost compared to other printers and the possibility to use a low weight transfer paper in mini jumbo rolls and a low consumption high density D.Gen inks. Jumbo-roll feeder – Designed for 3″ core with 12″ diameters roll, up to 120kg weight. 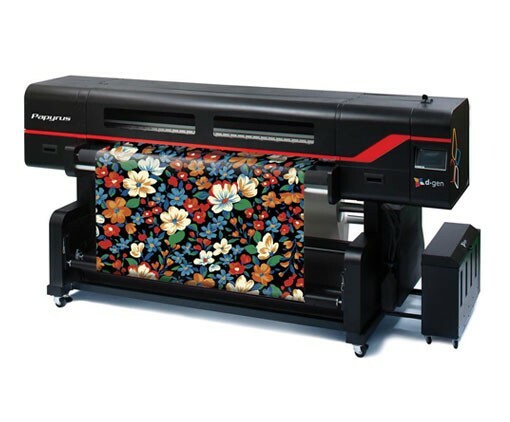 Simply, accepts 1000meter roll by 58gsm, 1.85meter width 1280 nozzles/color and 10.8cm printing band width, Papyrus G5 can run at 138m/h with a native 600dpi high resolution print head. Non-stop printing and superb run-ability allows a 24/7, 365 days production. printing resolutions up to 2.400 dpi with 7 picoliters droplet size at 8 levels greyscale. guarantees unbelievable printing speeds up to 138 sqm/h on a compact printer’s body.